Identification: A solution (1 in 20) responds to the tests for Potassium and for Phosphate. 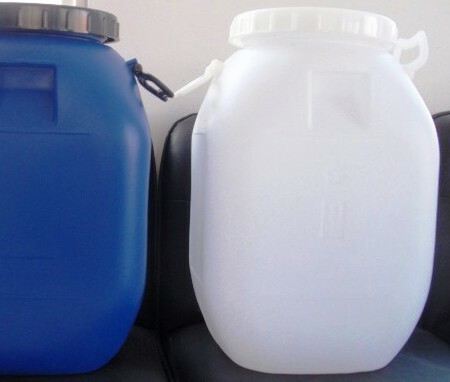 Insoluble substances: Dissolve 10 g in 100 mL of hot water, filter through a tarred filtering crucible, wash the insoluble residue with hot water, and dry at 105 for 2 hours: the weight of the residue so obtained does not exceed 20 mg (0.2%). Carbonate: To 1 g add 3 mL of water and 2 mL of 3 N hydrochloric acid: not more than a few bubbles are evolved. Chloride: A 1.0-g portion shows no more chloride than corresponds to 0.40 mL of 0.020 N hydrochloric acid (0.03%). Sulfate: A 0.20-g portion shows no more sulfate than corresponds to 0.20 mL of 0.020 N sulfuric acid (0.1%). Iron: the limit is 0.003%. Sodium: A solution (1 in 10) tested on a platinum wire imparts no pronounced yellow color to a non-luminous flame. Limit of fluoride: the limit is 0.001%. Limit of monobasic or tribasic salt: Dissolve 3 g in 30 mL of water, cool to 20C, and add 3 drops of thymol blue TS: a blue color is produced, which is changed to yellow (with a greenish tinge) by the addition of not more than 0.4 mL of 1 N hydrochloric acid. Identification: A solution (1 in 20) responds to the tests for Potassium 191 and for Phosphate. Loss on drying: Dry it at 105 for 4 hours: it loses not more than 1.0% of its weight. Insoluble substances: Dissolve 10 g in 100 mL of hot water, filter through a tarred filtering crucible, wash the insoluble residue with hot water, and dry at 105 for 2 hours: the residue does not exceed 20 mg (0.2%). Lead: not more than 5 ppm of Pb). 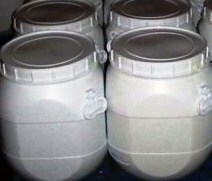 Metaphosphoric acid (HPO3), potassium salt. 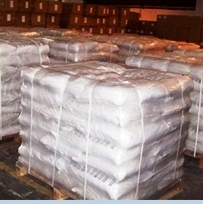 Potassium Metaphosphate is a straight-chain polyphosphate, having a high degree of polymerization. It contains the equivalent of not less than 59.0 percent and not more than 61.0 percent of P2O5. A: Add 1 g of finely powdered Potassium Metaphosphate, slowly and with vigorous stirring, to 100 mL of sodium chloride solution (1 in 50): a gelatinous mass is formed. B: Boil a mixture of 0.5 g of Potassium Metaphosphate, 10 mL of nitric acid, and 50 mL of water for 30 minutes, and cool: the resulting solution responds to the tests for Potassium and for Phosphate. Viscosity: Mix 300 mg with 200 mL of sodium pyrophosphate solution (3.5 in 1000), using a magnetic stirrer. Determine the viscosity of the clear solution obtained, or of the liquid phase of the mixture obtained after 30 minutes of continuous stirring: the viscosity is between 6.5 and 15 centipoises. Lead: not more than 5 ppm of Pb. Limit of fluoride: To pass the test. Reducing substances: Heat on a water-bath for 5 min a mixture of 5 ml of solution S, 5 ml of dilute sulphuric acid and 0.25 ml of 0.02 M potassium permanganate. The solution remains faintly pink. Chlorides: To 2.5 ml of solution S add 10 ml of dilute nitric acid and dilute to 15 ml with water. The solution complies with the limit test for chlorides (200 ppm). Sulphates: To 1.5 ml of solution S add 2 ml of dilute hydrochloric acid and dilute to 15 ml with distilled water. The solution complies with the limit test for sulphates (0.1 per cent). Arsenic: 5 ml of solution S complies with limit test A for arsenic (2 ppm). Iron: 10 ml of solution S complies with the limit test for iron (10 ppm). Heavy metals: Dissolve 2.0 g in 8 ml of water. Acidify with about 6 ml of dilute hydrochloric acid (pH 3 to 4) and dilute to 20 ml with water. 12 ml of the solution complies with limit test A for heavy metals (10 ppm). Sodium: If intended for use in the manufacture of parenteral dosage forms, it contains not more than 0.1 per cent of Na, determined by atomic emission spectrometry. Loss on drying: Not more than 2.0 per cent, determined on 1.000 g by drying in an oven at 125C to 130C. Bacterial endotoxins: Less than 1.1 IU/mg, if intended for use in the manufacture of parenteral dosage forms without a further appropriate procedure for the removal of bacterial endotoxins. pH: To 5 ml of solution S add 5 ml of carbon dioxide-free water. The pH of the solution is 4.2 to 4.5. Reducing substances: To 5 ml of solution S add 5 ml of dilute sulphuric acid and 0.25 ml of 0.02 M potassium permanganate. Heat on a water-bath for 5 min. The colour of the permanganate is not completely discharged. Chlorides: Dilute 2.5 ml of solution S to 15 ml with water R. The solution complies with the limit test for chlorides (200 ppm). Sulphates: To 5 ml of solution S add 0.5 ml of hydrochloric acid and dilute to 15 ml with distilled water. The solution complies with the limit test for sulphates (300 ppm). Arsenic: 0.5 g complies with limit test A for arsenic (2 ppm). Potassium Polymetaphosphate occurs as a white powder. It is a straight-chain polyphosphate having a high degree of polymerization. It is insoluble in water, but is soluble in dilute solutions of sodium salts. A. Finely powder about 1 g of sample, and while stirring vigorously, add it slowly to 100 mL of a 1:50 sodium chloride solution. A gelatinous mass forms. B. Mix 500 mg of sample with 10 mL of nitric acid and 50 mL of water, boil for about 30 min, and cool. The resulting solution gives positive tests for Potassium and for Phosphate. Assay: Not less than 59.0% and not more than 61.0% of P2O5. Viscosity: Between 6.5 and 15 centipoises. Potassium Pyrophosphate occurs as colorless or white crystals or as a white, crystalline or granular powder. It is hygroscopic. It is very soluble in water, but is insoluble in alcohol. The pH of a 1:100 aqueous solution is about 10.5. A. A 1:20 aqueous solution gives positive tests for Potassium. B. Dissolve 100 mg of sample in 100 mL of 1.7 N nitric acid. Add 0.5 mL of this solution to 30 mL of quimociac TS. A yellow precipitate does not form. Heat the remaining portion of the sample solution for 10 min at 95°, and add 0.5 mL of it to 30 mL of quimociac TS. A yellow precipitate forms immediately. Assay: Not less than 95.0% of K4P2O7, calculated on the ignited basis. Insoluble Substances: Not more than 0.1%. Loss on Ignition: Not more than 0.5%.